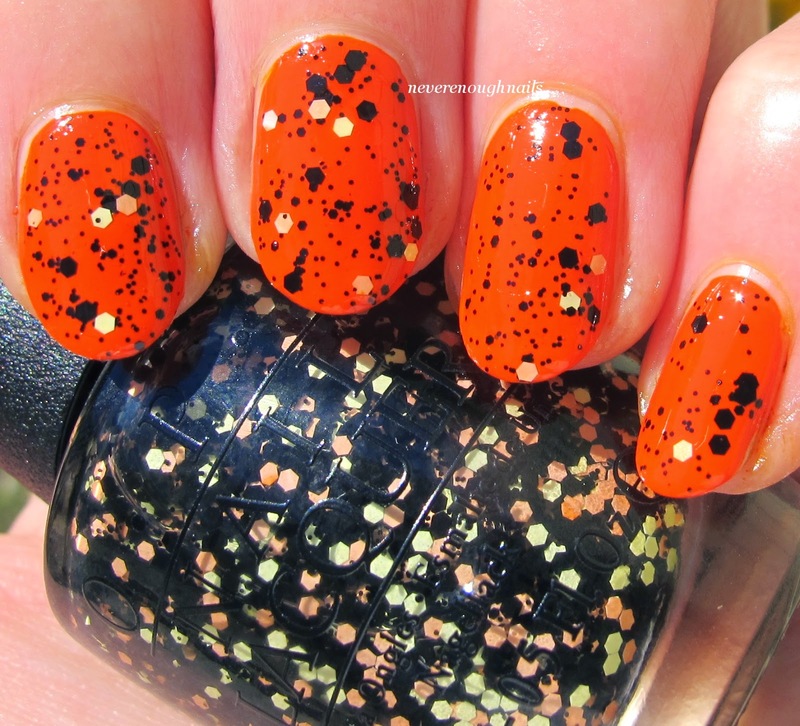 Never Enough Nails: OPI Peanuts Halloween 2014 Swatches! I'm starting to get in the Halloween mood. I ordered some new decorations, including a skeleton cat and a large hanging Pirate ghost, and I'm rocking these OPI Peanuts polishes for Halloween 2014. "It's The Great Pumpkin, Charlie Brown" is a classic Halloween movie and I still try to watch it once every year before Halloween, so I was excited to hear about this collection. With two cremes and two glitter toppers, you can create a wide variety of looks with these lacquers. 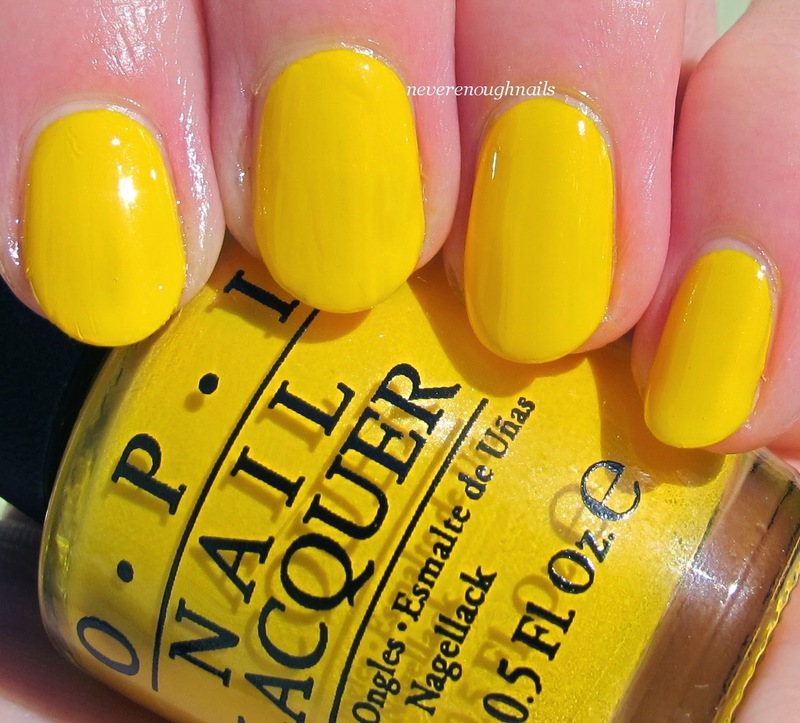 One of the cremes is OPI Good Grief!, a marigold yellow creme. Good Grief! was inspired by the yellow of Charlie Brown's t-shirt and it looks like a perfect match for it. It also reminds me of the yellow mums I have out on the patio right now! Good Grief! applied fairly well for a yellow. The first coat was a bit streaky, but it definitely evened out by the second coat. This is two coats and the pigmentation was really great. 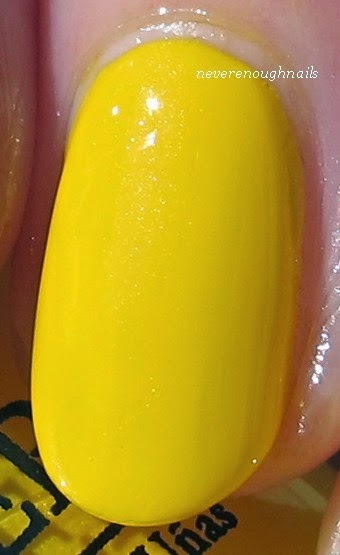 Some yellows really require a third coat, but not this one. As long as you let the first coat dry before applying the second, you should be able to get a streak-free finish in two coats. Just as a note- this polish has no shimmer. I know in the above shot it looks a little shimmery, but it must be residue from my top coat. 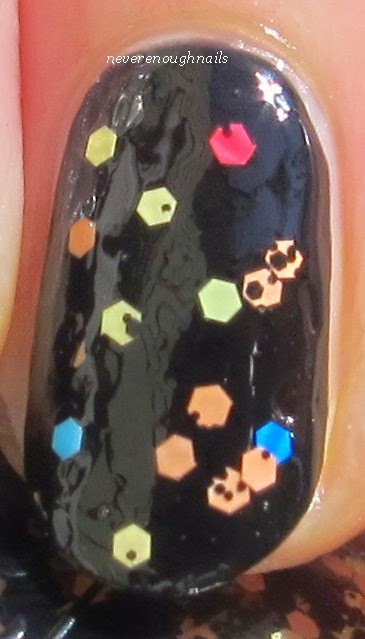 OPI To Be or Not To Beagle is Snoopy's glitter polish, with an assortment of colored matte hex glitter and tiny black glitters. This dries to kind of a matte/satin finish and I like that a lot. If you prefer shiny, you can always put a layer of top coat over it. These glitters lay nice and flat and don't feel rough. This is one coat of To Be or Not To Beagle over Good Grief!. To Be or Not To Beagle applied really well. The ratio of glitter to base polish was perfect, not gloopy at all. I love this combination. It's graphic-looking and bold. Love it! OPI Who Are You Calling Bossy?!? is a glossy black creme inspired by Lucy's black hair. I actually needed a new black creme, so I'm happy this is part of the collection. I use a lot of black polish around Halloween! I used two coats for these pictures. I think this could be a one-coater if you were topping it with glitter or nail art of some kind. It was nearly opaque and smooth in one coat, but I did feel like I wanted the second coat to make it more even and dark. The formula was really great though, perfect consistency. I HATE runny black polishes, there's nothing worse than trying to clean up black polish out of your cuticles. Grosssss! I did not do any clean up in these pictures. If I were actually going to leave this on, I would have fixed the shape of the ring nail there a bit, but I thought I'd show you how well it performed with no clean up. This collection didn't come with an orange creme, but I always love glitter over orange for Halloween, so I thought I'd swatch OPI Where's My Blanket??? over OPI A Roll in The Hague. Where's My Blanket??? 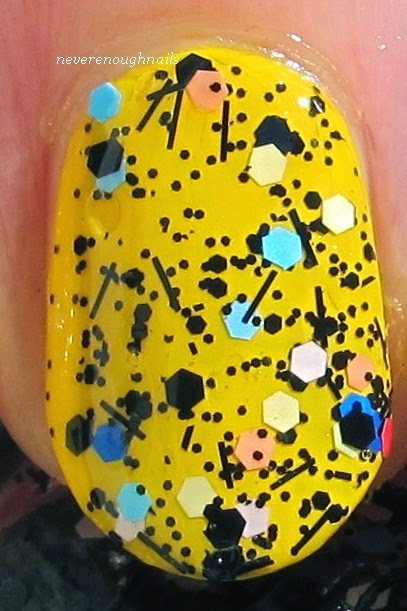 is a mix of yellow, peachy orange and black hex glitters with small black glitters in a clear base. 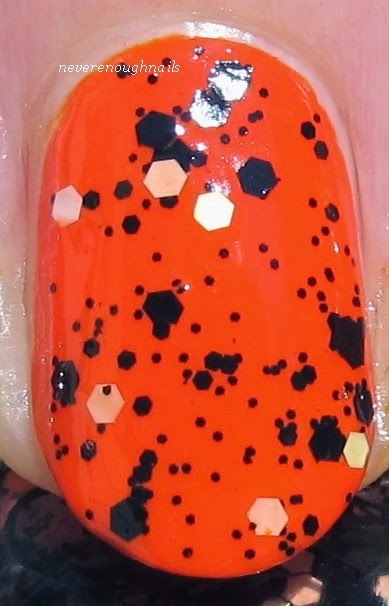 This looks perfect for Halloween over orange! Like To Be or Not To Beagle, this was easy to apply and had a good consistency. 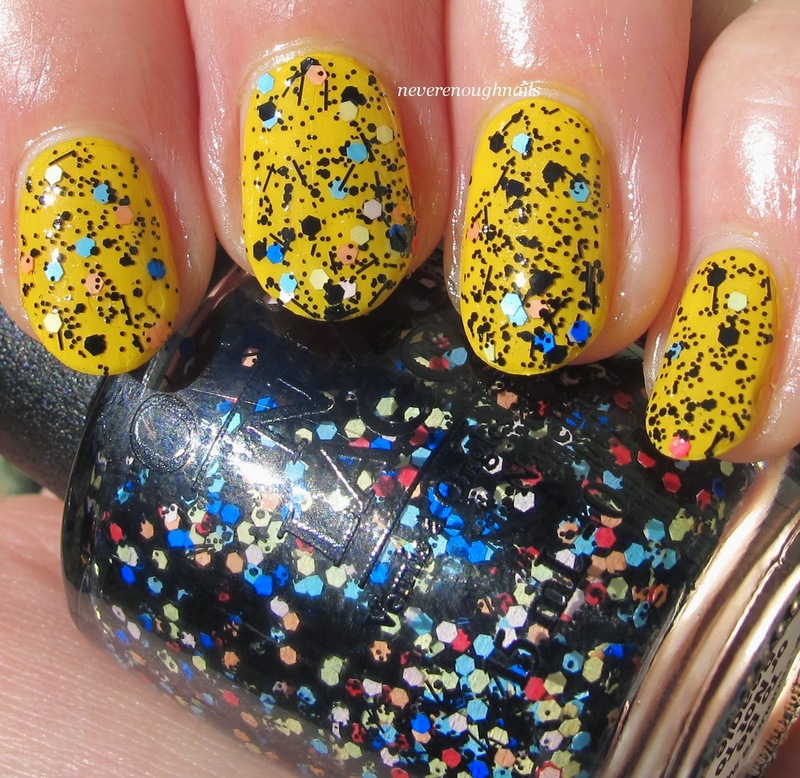 The glitter lay flat and feel smooth with a layer of top coat. For these swatches, I did one layer of To Be or Not To Beagle and one layer of Where's My Blanket??? over Who Are You Calling Bossy?!?. I wanted to see these mixed together just for fun and I like them together! Overall, I love the inspiration for this collection and I can't wait to watch "It's The Great Pumpkin, Charlie Brown" this year. I wish the collection included an orange creme called "The Great Pumpkin", but it probably wasn't possible for them to license that name. I do own enough orange cremes anyway haha! These four shades are also available in a mini pack ($13.95, $17.50 CAN) that comes with ten nail decals with designs ranging from popular Peanuts phrases like “Good Grief!” and “Pow!” to sketches of Snoopy and the signature squiggle of Charlie Brown’s shirt. The OPI Peanuts Collection is available now at professional salons. The yellow is really awesome! I wasn't sold on the collection, but after trying it I like them all!